It seems an understatement to say NVIDIA has been busy so far this year. First, at the Consumer Electronics Show in January, the graphics specialist simultaneously unveiled both its beefy Tegra 4 processor, and a curious Tegra 4-powered handheld gaming device called Project Shield. Then, in February, NVIDIA excited the smartphone market and sent shivers up the spines of Qualcomm investors when it announced the Tegra 4i. Why? The Tegra 4i stands tall as NVIDIA's first fully integrated 4G LTE mobile processor, featuring an integrated version of its i500 4G LTE modem, 60 NVIDIA GPU cores, and a quad-core CPU which was jointly designed by NVIDIA and processor specialist ARM Holdings. At the same time, as I noted last month, NVIDIA provided new details on its Chimera digital photography architecture. In addition to being integrated into its Tegra 4 and 4i platforms, Chimera should also help even further solidify NVIDIA's grasp on the industry by allowing photographers to capture wide-angle HDR images while the camera is moving. In addition, Chimera also lets users choose a static focal point in their scenes, helping them to maintain a properly-focused shot regardless of whether the camera or its subjects are moved. Of course, there's plenty more activity to note, from the use of NVIDIA's technology in the world's leading supercomputers to its new GRID-based virtual graphics products. That doesn't mean, however, that NVIDIA will be content to rest on its laurels anytime soon. 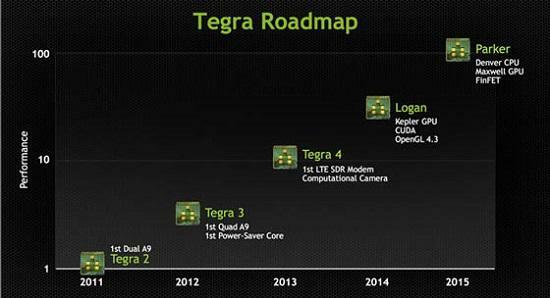 To the contrary, at its 2013 GPU Technology Conference, NVIDIA just described its future plans for both "Project Logan" and "Project Parker" -- or, as many are tentatively calling them already, Tegra 5 and Tegra 6. Source: NVIDIA 2013 GPU Technology Conference. This announcement, mind you, comes before we've even seen the very first Tegra 4 devices hit the market. Even so, NVIDIA management was quick to point out during its latest earnings conference call that, "at this point, [they] already have more design wins with Tegra 4 than [they] had in total with Tegra 3" -- and that's a great thing considering analysts at Needham downgraded the stock last month while complaining of the existing Tegra line's "limited traction in smartphones." Aside from the fact the Tegra 4i should provide plenty of incentive for smartphone makers to change that, there's even more to love about Project Logan. Logan will not only be integrated with NVIDIA's next-gen Kepler GPU and OpenGL 4.3, but also will be the first mobile processor to incorporate the company's high-performance CUDA parallel computing platform -- and yep, that's the same CUDA utilized by NVIDIA's Tesla processors for supercomputing applications. This, as NVIDIA CEO Jen-Hsun Huang stated, will enable mobile devices to do "everything that a modern computer ought to do." What's more, NVIDIA should have its first Logan processors ready later this year, with the line "easily" entering mass production by early 2014. Rumors of Logan, however, had already been circulating for some time, so it wasn't particularly shocking in its own right. That's why Huang decided to also take the wraps off of Project Parker, and why many folks in the audience at the presentation visibly perked up in their chairs when he did. According to Huang, Parker will be a system on a chip which distinguishes itself in three ways. First, it will be integrated with another jointly-designed NVIDIA/ARM CPU, called "Denver," which will be the world's first mobile high-performance 64-bit ARM processor. Second, Parker will be the first mobile chip manufactured with low-power FinFET transistors, which will help to reduce the system's size and further decrease power consumption. Finally, Parker will include NVIDIA's next-next-gen GPU, called Maxwell, a 20 nanometer architecture which promises at least twice the performance per watt over even Kepler. When all is said and done with the release of Parker, NVIDIA will have increased the performance of its Tegra processors by a staggering 100-fold over the course of just five years. Now, for just another moment, let's ignore the fact that NVIDIA holds a ridiculous $6 per share in cash and almost no debt on its balance sheet. Heck, let's even put aside its enjoyable propensity for choosing project code names based on comic book characters. In the end, I'd be almost be willing to buy shares of NVIDIA based just on its Foolish (with a capital "F") long-term mindset and its demonstrated ability to innovate and thrive in the ever-changing world of technology. Of course, I'm happy I own shares of NVIDIA today, but I also find myself increasingly tempted to add to that position as the stock remains stuck in neutral. I'm convinced the broader market will catch on and reward long-term shareholders for their patience. NVIDIA was ahead of the curve launching its mobile Tegra processor, but investing gains haven't followed as expected, with the company struggling to gain momentum in the smartphone market. The Motley Fool's brand-new premium report examines NVIDIA's stumbling blocks, but also homes in on opportunities that many investors are overlooking. We'll help you sort fact from fiction to determine whether NVIDIA is a buy at today's prices. Simply click here now to unlock your copy of this comprehensive report. The article NVIDIA Has Big Plans for the Next Few Years originally appeared on Fool.com. Fool contributor Steve Symington owns shares of NVIDIA. The Motley Fool recommends NVIDIA. The Motley Fool owns shares of Qualcomm. Try any of our Foolish newsletter services free for 30 days. We Fools may not all hold the same opinions, but we all believe that considering a diverse range of insights makes us better investors. The Motley Fool has a disclosure policy.